We are not all born equal. Circumstances not of our own making factor heavily in the opportunity and quality of life we lead. Activism addressing issues of social inequality such as gender pay, disability employment and recognition of our First Peoples has created a better and more inclusive society. While much more needs to be done, there is a ready acceptance by most Australians that policies which discriminate against a person based on gender, race, disability or religion, are wrong. However, when it comes to economic policies that favour one group of people ahead of another we seem less concerned. Economic inequality, whether deliberate or as a consequence of the operation of the market, seems somehow okay. Governments have recognised that power imbalances exist in our market-based economy, and have enacted legislative protections in areas such the labour market. However, such laws only provide minimum safeguards. Our legislators seem reticent to tackle the economic policies that create or entrench economic inequality. How is it for example that we allow investors to leave units vacant in the Docklands while young people struggle to access the housing market in Melbourne? Or force the employees of charities to bear the risk of government policies of marketisation and competition in the social services sector through the casualisation of their employment? Or require students to carry the burden of debt for undertaking tertiary studies, while allowing multinational companies to construct their financial affairs to pay little or no tax in Australia? Or permit the government to provide businesses tax relief while implementing cuts to welfare payments and supports? "It seems that our poor, vulnerable, sick and aged have a place in our society, and it is at the bottom of the pile." In doing so, he marked out his party's agenda to arrest inequality in all its forms, particularly economic policies that give primacy to those with wealth at the expense of those without. Between 2011 and 2014, the Gini coefficient for household disposable income decreased from 0.311 to 0.299. The Household, Income and Labour Dynamics in Australia (HILDA) survey has shown relatively little change in household income inequality between the endpoint of 2001 and 2014. Analysis released in 2015 showed while income inequality has risen in most OECD countries over the past three decades, in Australia it had increased by substantially less than many comparable OECD countries. And the poorest 20 per cent of households, on average, receive cash transfers and social services benefits worth more than eight times what they pay in taxes. There are two propositions underpinning Morrison's position. First, Australia does not have an inequality problem. Second, if there is inequality, we can rely on the neoliberal formula and trickle-down economics to deliver everyone the prosperity they seek. 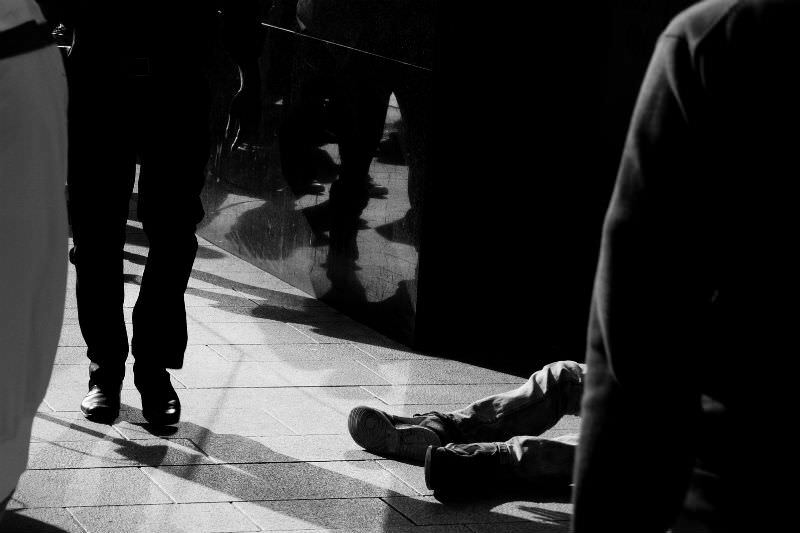 Indeed, to deny the existence of economic inequality denies the lived experience of millions of Australians who struggle to put food on the table and provide their families with safe, secure housing. To state that the poorest 20 per cent of households, on average, receive cash transfers and social services benefits worth more than eight times what they pay in taxes is to traverse a well-worn and offensive path that we are a society of lifters and leaners. It seems that our poor, vulnerable, sick and aged have a place in our society, and it is at the bottom of the pile. Their value is not measured in terms of human dignity and social contribution but in terms financial cost, to be supported only if we can afford to do so. We have given legislators a free pass when it comes to economic policies that discriminate against those without means. This creates systemic inequality, and it needs to be addressed urgently. Economist Milton Friedman wrote: "A society that puts equality before freedom will get neither. A society that puts freedom before equality will get a high degree of both." A 2008 report, “A roof over every head”, blamed youth homelessness on the fallout of three decades of economic and social changes including no-fault divorce and single parenting. Globalisation has enriched multinationals and countries like China. However the US Economic Policy Institute showed that between 1973 and 2014, productivity grew by 72.2 percent but wages grew by only 9.2 percent, a 90 percent decline from post war levels. No-fault divorce and single parenting coupled with the welfare state have been no less devastating. The USA War on Poverty cost $21.5 trillion but has only produced a permanent underclass totally dependent on welfare. Black economist Walter Williams wrote, “The welfare state has done to black Americans what slavery couldn’t do, and that is to destroy the black family.” The pathologies that resulted from the welfare state are not the fault of the poor, who have simply adapted in a logical and predictable way to the incentives inherent in the system. This essay seems only to promote more of the same. On the JESUIT SOCIAL CENTRE TOKYO website I read, "Nicholas Stern, well known for his research on the impact of the economics of climate change, maintains that the two great challenges of the 21st century are overcoming poverty and managing climate change, not as separate aspects but intimately linked in mutual interdependence. The mechanisms that ultimately link human development and poverty reduction to climatic changes are now more evident, showing the links with employment and livelihoods, health, gender, and security. To give just one example, rural women are heavily dependent on the natural environment for their livelihoods, which are directly affected by climate – related damage or scarcity of natural resources. ..." I agree! The Turnbull Government have a very poor record of action on climate change. The Labor Opposition have a better record, but in my opinion the Australian Greens are the only Austrlian political party that is really serious about tackling climate change. For example, Bill Shorten is 'fence-sitting' in relation to the proposed Adani mega-coalmine in Queensland's Galilee Basin, while the Great Barrier Reel, with its 70000 jobs is in grave danger of dying from warming ocean water. Thanks Joe for your contribution to the vexed topic of inequality and individualistic Neo-liberal ideology. Only approx. 2 months ago the ABC radio public were informed that a building site in Hawthorn, originally marked for low income families, was going to be developed and the majority of the housing stock on it would be sold for profit ... WITH a small percentage of that stock to go to low income families FOR A TEN YEAR PERIOD after which they would have to move out! How sneaky is that ... and it's been blessed by a Labor Government and local council. The two mantras my father (who died in 1967) used to say summed up the Australian way back then ... were "I'm alright Jack" and "Not in my back yard". What's changed? Look at the profile of volunteers in Australia and you will see what is happening to the social glue that holds so much together. The problem of individuals or common good is that it is dualistic ... and governments are really good at driving wedges and dividing and conquering groups and populations ... after all to them, it's all about power. To help transcend the dualisms, both a top-down and bottom-up approach need to be taken (some options of which you've outlined). Unfortunately, with a diminishing middle class (usually the most generous into civil society in several ways) it also requires a buffer at both ends for this group if they aren't also going to fall off the bottom edge in the proposed transition. Sadly, I'm not convinced Liberal or Labor have our best interests at heart. Just look where the pollies go after they've left politics ... very cosy stuff, mostly. Don't forget, it's also a tactic to distract the masses ... casualisation of work, and the gig economy have done that very nicely! There is a simmering rage in the underbelly of society here too, not just in USA ... it's been gaining momentum for some time now. "The welfare state" is not about "welfare" ... the deception in the term belies a reality that few people in struggle-town could remotely identify with. In the midst of a civilisation transition, we need to come up with language that is true and honest if we want people to back new ideas. Let's start there! Looking at Gini coefficient for income inequality (https://data.oecd.org/inequality/income-inequality.htm) Australia is slightly less equal that Sweden and Norway, but slightly more equal than the Netherlands and Canada. We can do more (like all wealthy countries) but this is not a crisis.